Exodus 12:1-11, 14, Passover is established. Sometimes, however, the demands made by the overseer are unreasonable. In my case, I once went to my boss and pointed out that if I did everything he was committing me to, I’d be working about 120 hours a week. He was a bit taken aback by this information, and we figured out a way to get my commitments down to a more reasonable level. The people of Israel of Israel had two problems with commitments. One was that the overseer raised their work commitments to about 200% by requiring that they make bricks and gather all the straw that was needed for the brick. The second problem with their commitments was that they weren’t committed to the idea that God gives good gifts. When the overseer makes unreasonable demands, whom do they blame? The overseer? No. They blame Moses and Aaron. Moses and Aaron turn around and blame God. Our Fourth of July fireworks displays are an annual celebration and reenactment of the historical events surrounding our declaration of independence and of the battles we fought to establish our nation. The Exodus of the Jews from Egypt is one of the great defining moments in the history of the Jewish people, and Passover is the annual celebration and reenactment of this event. In the final and most terrible plague on the Egyptians, God passed through Egypt, slaying every first-born of man and beast. God directed each Jewish family to slaughter a lamb and place its blood on their door jamb. God saw the blood and passed them over, and their own first-born children and animals did not die. The rules for the celebration of Passover were strictly laid down about 3000 years ago and are still followed meticulously in nearly all Jewish households today. If you ever have the opportunity to attend a Passover seder, I urge you to go – you will have a lot of fun, and the food is good. Just like the Fourth of July! The ideal place to celebrate Passover is in Jerusalem, and in fact any Jew who celebrates Passover in any country other than Israel must include the words, "Now we are here; next year may we be in the land of Israel." The service traditionally ends, "Next year in Jerusalem!" It is not a coincidence that Passover and Easter always come at about the same time of the year. Jesus entered Jerusalem on the first day of what Christians now call Holy Week in order to celebrate the Passover there with his disciples. Because Jews determine the date of Passover on the Jewish calendar, it sort of wanders around on the Gregorian calendar and may fall on any day of the week. Christians determine the date of Easter by one of two complicated systems (depending on the denomination). Both systems make Easter fall on a Sunday, but both relate Easter to Passover, which is why Easter also wanders around on the Gregorian calendar. As a matter of fact, both Passover and Easter always fall on exactly the same day, providing you look at the right calendar. Do you ever use the words whatsit, doodad, thingamabob, or doohickey? Do you have family names for things? Yesterday while we were babysitting, my husband asked our baby grandson if he wanted some bonos. They looked like Cheerios to me. A long time ago, my husband's cousin couldn't say "doughnuts," so he called them "bonos." By extension, Cheerios were also called bonos by the entire family. The Israelites occasionally used the same kinds of words. "Manna" means "whatsit." They called this new, strange food "whatsit" because when they first saw it, they all asked, "manna? what is it?" The distance from Cairo to Jerusalem is about 260 miles, or about 26 days max if you are traveling with herds, children, and pregnant women, on foot. The Israelites didn’t have to go that far, because they were actually starting out somewhere to the west of Cairo, and they didn’t have to go as far as Jerusalem. So why did they spend 40 years wandering around in the desert? It was a matter of trust. They first got to the Promised Land in a couple of months, maybe less, after leaving Egypt. Then they wimped out. They didn’t trust God to be with them and to give them the land, and they refused to enter it. So God started over on building trust by sending them back out into the desert and giving them food each day, just enough for that day. Eventually they came to have confidence that what God promises, God delivers. Then they were ready to enter the Promised Land. Most of us who are reading this live in the same community, and in the past several years we have been forcibly reminded that our community is located in a desert. Even though we can always get water from a tap, it just isn't the same as water coming down from the heavens and refreshing the earth. We want rain! We need rain! It will be several years before our piece of the desert recovers, even if the fall rains and winter snows have returned for more than just this year. Like us, the Israelites were desert people. Several of the scriptures for this week focus on the importance of water in the desert – not only physical water in a physical desert, but also living water in the desert of our souls. God knows our needs, and he supplies both kinds of water. God gave the Israelites the Ten Commandments while they were in the desert after leaving Egypt. In Egypt they had been slaves, and the only laws they were familiar with were the Egyptian laws for slaves. Now they had new laws: holy laws for a free people whose only king is God. The Israelites loved the Law and were proud that they had been chosen to receive it. "What other nation has such righteous laws?" they asked themselves. "The Law of the LORD is perfect!" they declared. Western society largely agrees – the law given in the desert remains the foundation of western jurisprudence. Back when I had student interns working for me, my basic office rule was this: "You only get the rules you earn." For example, one student earned the rule, "No novels in the office." Another one earned a rule for everybody: "Students will not download items from the web without prior permission." God has given us only the rules we have earned. Adam and Eve were given one rule – and they broke it! This earned everybody a new rule: work or go hungry. By the time of Moses, we had earned quite a few more rules. Cain earned "No murder" for all of us. We earned "No idols" by worshipping the golden calf. God's Law didn't put these ideas into our minds, but it did tell us where we had gone wrong. Exodus 23:14-17, The three feasts are commanded. I love to eavesdrop on the conversations between God and Moses. God says to Moses: "Why did you ever bring these people out of Egypt?" 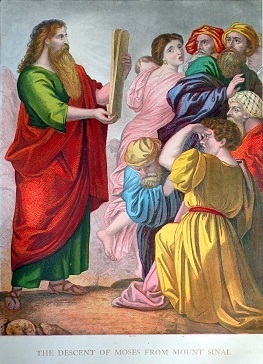 Moses answers: "Why did I bring them? I didn't bring them! YOU brought them!" When people are arguing about who brought you to the party, you know that your behavior has been unacceptable. Moses' conversations with God show us both the intimacy of prayer and importance of intercessory prayer. Recently I needed a B-12 shot, which is normally administered by a nurse. Nevertheless, I told the receptionist I wanted an appointment with the doctor, because sometimes I get there and there's a problem because the order hasn't been written or something. When I need a B-12 shot, I can't cope with any sort of problem at all, so I wanted to see the doctor first. In our reading, Moses is a bit worried about going up to Palestine. God says he will send an angel with Moses and the Israelites, but Moses isn't satisfied. He's willing to go if God Himself will go along, but he doesn't want to go alone or with some angel, who might not be able to take care of whatever happens to come up. Just to be sure there's no problem, he wants to see God, not an angel. Exodus 34:18-23, The three feasts commanded. Some older translations of the Bible have "horns" on Moses' face instead of saying that his face "shone." Do you remember that Hebrew originally had no vowel markings? "Horn" is "qrn" (qeren) and "shown" is also "qrn" (qaran) . Michelangelo's Moses shows the importance of reading a good, modern translation! Copyright 2009, 2011, 2013 by Regina L. Hunter. All rights reserved. Parts of this page have been prepared for the web site by RPB. 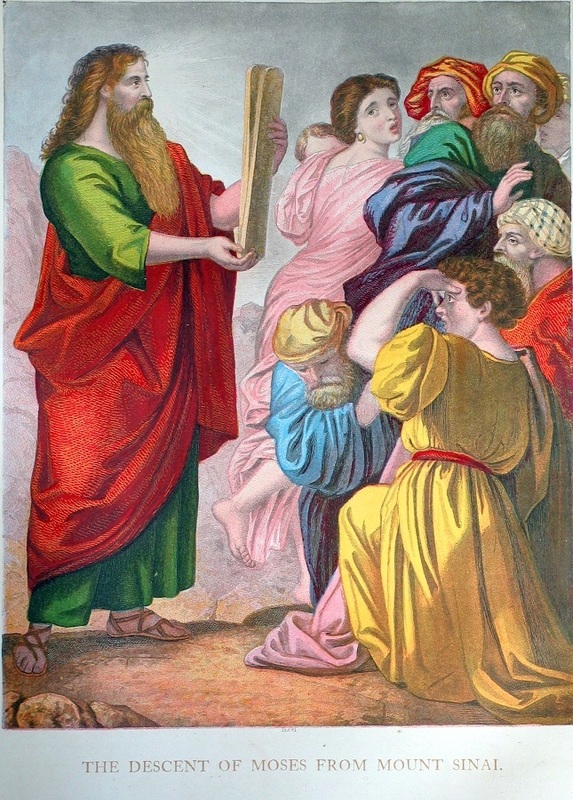 The illustration showing Moses' descent from Sinai is from the Binns family Bible, now in the private collection of Regina L. Hunter.